Just when I was beginning to think the 3D fractal scene was plateauing and running out of interesting themes to explore… along comes something sharp. You have to look closely at the little doorways and windows in the rings near the bottom left and right corners. Sharp. Very sharp. A jet turbine of knife like blades. Note the smooth, clean details on each blade. Seriously sharp. That one is Uber-Sharp! And shiny too. Everything is high-res carved and meticulously engraved. I’m not sure why this very sharp, high-quality rendering impresses me so much. 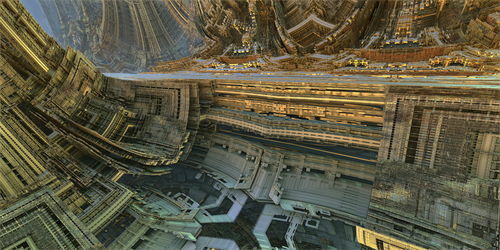 Maybe it’s really how well it displays the underlying mandelbox structure of the imagery. It looks like a new category of 3D imagery and that’s why I thought readers might not want to miss it. This one by kr0mat1k perhaps explains what makes these ultra sharp images so interesting. If you look at the fullsize version you’ll see that the edges resemble hand drawn outlines. 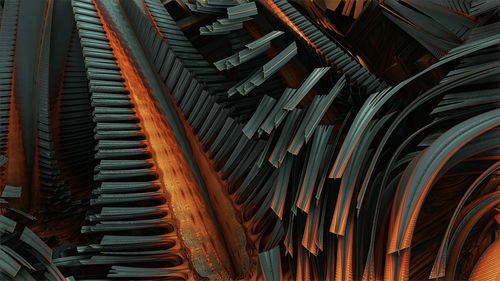 This rendering style is different than the usual mandelbox type and presents a traditional –hand made– appearance rather than the more common computer renderings I’m used to seeing. 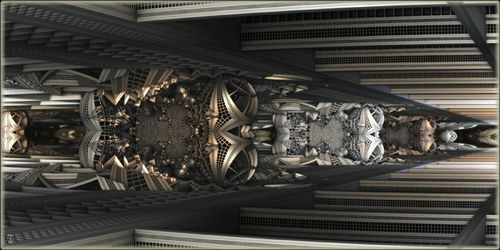 Inception could easily trick non fractal viewers into thinking the image was a pen and ink or pencil and watercolor image. Except, of course, for the fabulously intricate and wildly creative imagery that it contains. What artist has ever made up something like this themself? Not even Escher drew images this complex and organically composed. MarkJayBee takes this sharp, detailed style and manages to give it a dusty, realistic look while maintaining the “sharpness.” He’s got a whole series of these Limbo City images on his Deviant Art site. I’ll bet printed versions of these images are even more impressive since the intense detail would be much more visible in the high-res world of prints. 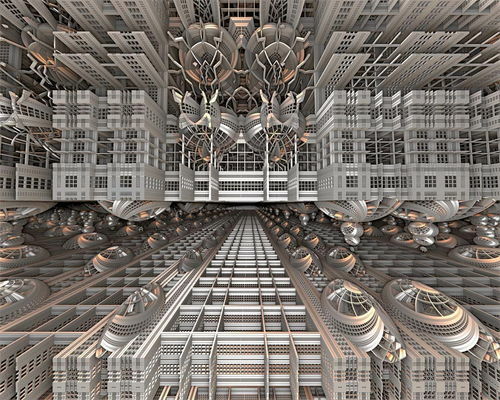 On the other hand, I suspect the rendering times for images like this might be higher than the other, less detailed mandelbox images. 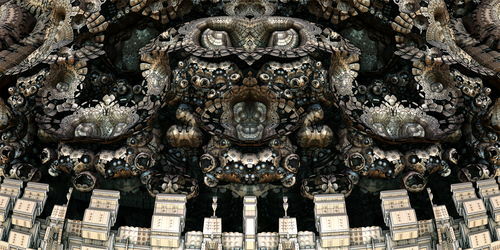 This one’s a nice combination of iron girders and the more traditional organic fractal shapes that us old folks are used to seeing. Arranged like wall partitions sporting decorative artwork the series of slabs in the middle creates a nice futuristic (and yet also cave like) hotel lobby or ritzy parking garage (without floors). I’m sure you can “feel” the inspiration in this one too. This one is so sharp I want to put on gloves. 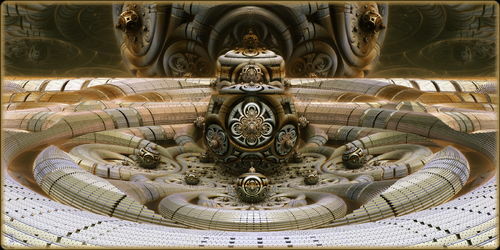 Just like kr0mat1k’s Inception, the rendering in this one goes beyond what I’m used to seeing in mandelboxes and enters into a whole new graphical style and that’s what I suspect is inspiring the other mandelboxers on Fractalforums.com. 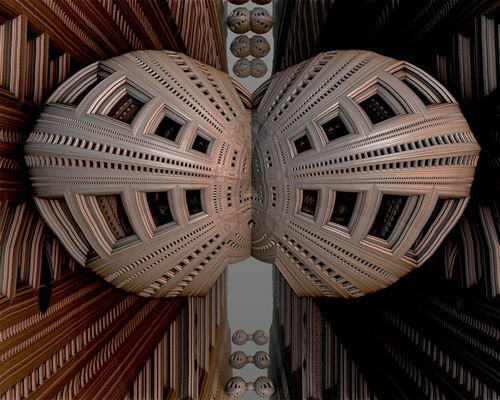 Keep an eye out on this page on Fractalforums.com if you want to see where this sharp new style goes in the future: Last Pictures Uploaded. Wear some gloves, just in case.